Nanos has just released a poll conducted not this past weekend, but during the one before. This is the fourth poll in a row showing a double-digit Tory lead nationally, so it's pretty safe to say that we have indeed seen real movement over the past few weeks. The NDP can also celebrate a nice 23.4% in Ontario, but its Western numbers are very weak. The only silver lining for the Grits is a respectable 24.4% in Québec, but even that is barely more than their 2008 result. The average popular vote lead for the Tories is 11.5%, just above their margin of victory in 2008. 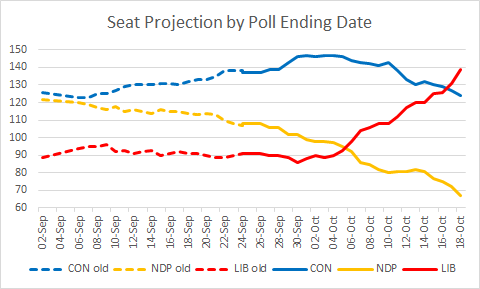 For the Tories, the easiest ways to get the last 6 seats needed for a majority are by winning Liberal seats in Ontario and NDP seats in BC. 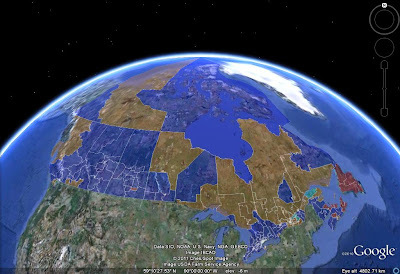 What many thought impossible for a long time must now be considered: a majority government with virtually no Québec representation, and no seats whatsoever in Greater Montréal, which contains roughly as many people as Alberta. Even the Liberals had two Alberta seats when they were in government! 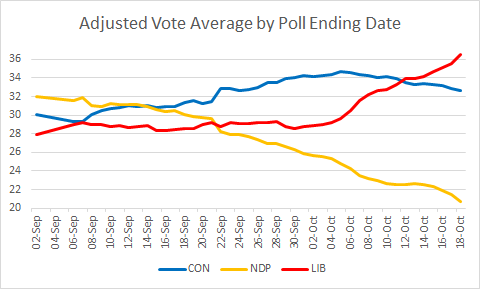 Based on the trends in every general election since 2000 a drop of 1-2% for the Liberals is not unlikely. Six seats may be low balling. The CPC would be targeting in upwards of 20 ridings in order to convert 6-7. A slim majority would be problem if one or two defect or are absent.